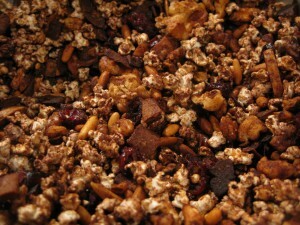 This is an altered version of a recipe supplied by Just Poppin for their granola. It was a pleasure to help create this ultimate snack food recipe! 2. Place ingredients on pan and place in preheated oven for 10 mins. 3. Lower oven temperature to 300 degrees. 4. Toss mixture and evenly distribute on pan. 6. Pull out when golden. Let cool. Toss in currants.